Nestled against the Caribbean sands of Palm Beach, this oceanfront hotel offers modern, recently upgraded guest rooms and suites, deluxe amenities and four-star service. Relax on luxurious bedding, stay connected with Wi-Fi access and enjoy stunning views of the ocean or resort's garden from private balconies. 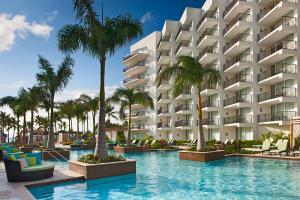 Elevate your Aruba trip by choosing a premier suite to enjoy access to the exclusive Tradewinds Club. Indulge in a massage at the full-service spa or visit the 24-hour fitness center. Grab a cocktail in a private cabana, then take a dip in the H20asis adults-only pool. Aruba Marriott Resort & Stellaris Casino also offers an array of dining experiences, including Ruth's Chris Steak House, Atardi and La Vista. After dining, try your luck at the 24-hour Stellaris Casino. Located in the Palm Beach area, 7 miles from the Queen Beatrix International Airport and 3 miles from the capital of Oranjestad. Ruth’s Chris Steak House, La Vista, Atardi, Waves Beach Bar and Grill, The Lobby offering an extensive cocktail list, live entertainment, and fresh sushi and sashimi options. Starbucks, H2O Adult Pool Bar, Gelato & Company. Glass Bottom Boat Cruises, Indian Rock Gardens, Island Tours, Jeep Safari Tour, Scuba Diving & Snorkeling Trip, Tierra Del Sol Golf Club.